I’ve managed to get another plot! It’s on the same site has my existing one and better still, it’s the plot next door. My plans for the new plot is to make it into a work area with a couple of beds. The problem I have got with my existing plot is that I’ve got nowhere to work (sowing and planting up seedlings etc), so this new plot with help tremendously. But first things first, I must clear it and erect some sort of fence as the current fence has fallen down. The plot is pretty overgrown, the weeds are almost 6 foot tall in places, but with winter on the way, most of these should die back. My dad made a start last week and on Sunday morning I went down to clear up the ‘work area’. The weeds were pretty dense but after 45 minutes of work, the area was clear and I had the weed fabric down. As I was clearing the area, I found a couple of bags of compost, an old wheelbarrow, some tools and handfuls of canes. The wheelbarrow could do with some work, but I think it can be repaired. 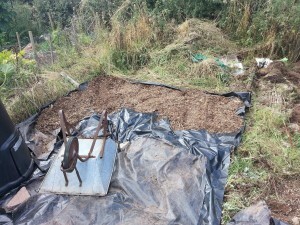 The compost will be used in the new beds to improve the soil and the tools will be cleaned and will be put into use. My plan was to cover the area in bark chippings but unfortunately, the pile at the top of the site which anyone can use was running low and I wanted to leave some for other people. Hopefully it will be topped up soon. Back on the other plot, I’ve got some more raised beds built and have started to fill them with manure, grass clippings and compost. These will be planted up with garlic and onions within the next couple of months. I’ve also had to secure my bean frames as they’ve started to fall over and tomatoes are bulking up nicely. There is a definite change in seasons as things are starting to come to an end and my winter veg are starting to take off.